This entry is part 4 of 13 in the series Magento 2 UI Components. Earlier posts include Magento 2: Introducing UI Components, Magento 2: Simplest UI Component, and Magento 2: Simplest UI Knockout Component. Later posts include Magento 2: ES6 Template Literals, Magento 2: uiClass Data Features, Magento 2: UI Component Data Sources, Magento 2: UI Component Retrospective, Observables, uiElement Objects, and Variable Tracking, Magento 2: uiElement Features and Checkout Application, Magento 2: Remaining uiElement Defaults, Magento 2: Knockout.js Template Primer, and Magento 2 UI Component Code Generation. In our previous two articles we ran through creating a new UI Component from scratch. While we were successful, we needed to add a class <preference/> (i.e. a rewrite) that disabled Magento 2’s XSD validation. While this was useful as a learning exercise, it’s not that helpful in a real world. It’s probably OK for a developer managing a single Magento system to use a class <preference/>, but those sorts of developers probably aren’t creating UI Components. For an extension developer, disabling XSD validation with a class preference seriously compromises the stability of the systems an extension will be deployed to. This problem with the XSD files sheds light on an untrue thing the software industry likes to tell itself over and over. Namely, that it’s possible, purely through use of advanced design patterns, to crete a system that will be both flexible and stable for developers who didn’t create the system. It’s clear that Magento 2 set out to create a flexible system for developers — plugins, dependency injection, RequireJS map features, etc. However, the XSD schema files (a tool meant to reign in the complexity of the XML files) ended up limiting the flexibility of the UI Component system. Whatever role systems design, and gang-of-four style design patterns play, time and time again we rediscover that the only way to build flexible and stable systems for your end-user-programmers is to listen to them and adjust the system over time toward real world usage patterns. Even if (or especially if) this means abandoning whatever high minded ideals your project’s trying to bring to the table. All that, however, is a topic for another time (and possibly for all-time). Today, carrying with us the lessons learned so far, we’re going to revisit our simple UI Component. This time though we’re going to do it with XSD validation on, and come up with a pattern we can reuse in real world projects. The specifics here were tested against Magento 2.1.1, but the concepts should apply across all Magento 2 versions. The first thing we’ll want to do is disable our Pulsestorm_SimpleUiComponent module. We’re doing this to reenable the XSD validation for XML files. Run the following command, and you should be all set. If you never created a Pulsestorm_SimpleUiComponent module, this step is not necessary. Info: Some modules might require static view files to be cleared. To do this, run 'module:disable' with the --clear-static-content option to clear them. Once we’ve done that, we’ll want to create a new admin module for our UI Component. As usual, we’ll use pestle for this. 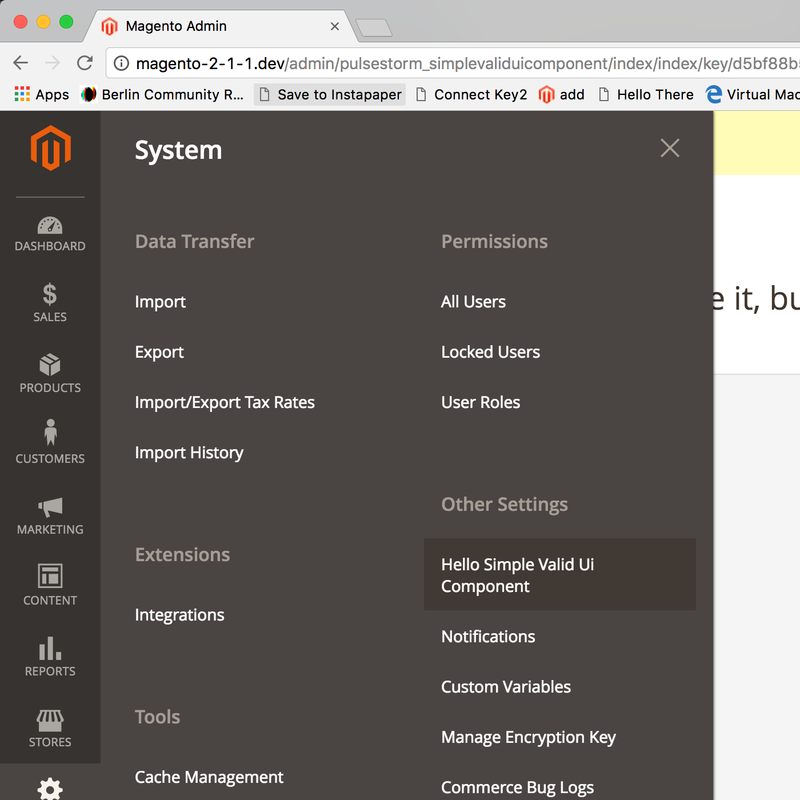 With the above in place, clear your cache, and you should be able to navigate to a System -> Other Settings -> Hello Simple Valid Ui Component menu in your Magento backend. With our boilerplate generated, lets get started! As we did earlier in this series, we’ll add a new <uiComponent/> to our layout handle XML file. and then we’ll create an XML file for this named UI Component. If we clear our cache and reload the page, we’ll end up with an error something like this. 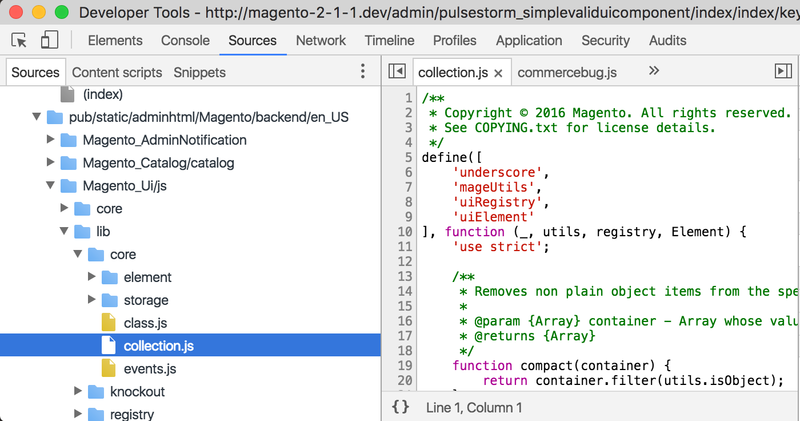 As previously mentioned, this error happens because there’s no pulsestorm_simple_valid in Magento’s vendor/magento/module-ui/view/base/ui_component/etc/definition.xml file, and we can’t add one because Magento’s XSD schema validation file for UI Component files doesn’t allow root nodes named <pulsestorm_simple_valid/>. Unfortunately, there’s no way we can work around this. The schema is the schema. Even if we removed the xsi:noNamespaceSchemaLocation from our XML files, Magento’s merging our nodes into XML trees that use this XSD file. As of Magento 2.1, there’s no way for third party developers to distribute UI Components without some half-baked module that disables or modifies the XSD validation routines. This is disappointing. However, we can still take advantage of the <uiCompnent/> tag if we change our root node to the following. The <container/> node is a valid root level node. If we reload with the above in place, we’ll end up with the following error instead. Reload your page with the above in place, and you should see your page rendered again, sans errors. If we take a look at the <container/> node’s definition.xml configuration. We see its XHTML template is templates/container/default, and its component is the RequireJS map alias uiComponent (Magento_Ui/js/lib/core/collection). The templates/container/default XHTML template, however, does not suit our needs. It’s not 100% clear what this template is for. Magento’s core ui_component files use <container/> as a sub-node, which means the XHTML template is never rendered. It’s likely this is some legacy cruft left over from earlier days when container was used by Magento as a root level node. Or maybe it’s something forward looking. Whatever the reason, this is probably why we can use <container/> as a root level node in the first place. It’s hard to say if this “feature” will stick around, but for now it’s the best we have. Remember, the definition.xml file is where the default sub-nodes for a particular node are set, but each individual file in the ui_component folder can override these values. We’ll also want to create the xhtml file for our templates/pulsestorm_simple_valid/default template. The code above is based on the default XHTML for a listing grid (vendor/magento/module-ui/view/base/ui_component/templates/listing/default.xhtml). While it performs the same Knockout.js scope kickoff as the template from our previous articles, there’s a few more things going on here that are worth mentioning. First, let’s start with what we know. We have our standard Knockout tag-less template binding. We also know that Knockout’s view model for this section is set by the outer scope binding. However, if we look at that scope binding. We talked more about these template tags a few articles ago. We have an XML namespace declaration in the root level <div/>, as well as a schema validation file (xsi:noNamespaceSchemaLocation). Remember — these are XHTML, not HTML templates. They behave like XML files. This also means you’re only allowed one top level node in an XHTML template. While these attributes aren’t strictly necessary, they’re used in the Magento core XHTML templates so it’s best to use them here for consistency. Covering the entire xs:schema language is a task beyond the scope of this article, but the above says that our xhtml files must have a root node of div, or form. Also, leaving the xsi:noNamespaceSchemaLocation out of our file won’t skip validation, as these .xhtml files are merged into an XML tree that includes this schema. Alright, if we clear our cache and reload the page with the above in place, we won’t see anything changed on the page. However, using the Sources tab of Chrome’s debugger, we can see Magento has included collection.js (from Magento_Ui/js/lib/core/collection, which is the RequireJS library uiCollection points at). 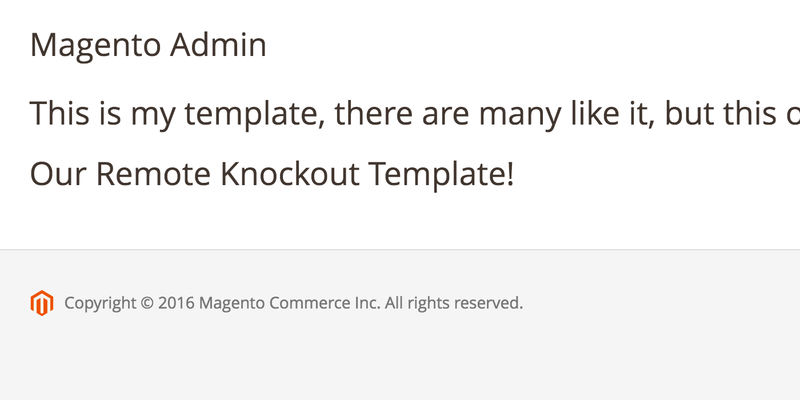 We can also (via XHR debugging) see that Magento has downloaded the collection.html Knockout.js template. If you’re unsure of the significance here, you probably want to review our last article. Our next step is adding some child components to render. 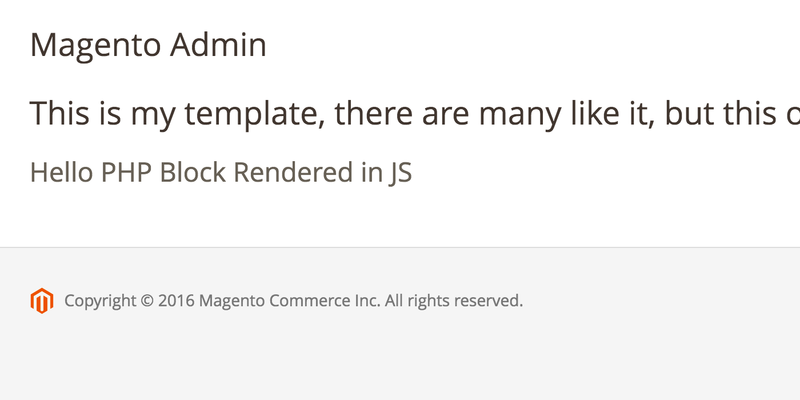 We see this rendering happens via the RequireJS Magento_Ui/js/form/components/html module. Or, said more completely, the Magento_Ui/js/form/components/html module returns a Knockout.js view model constructor with a Knockout.js “Magento remote” template of ui/content/content. We’ll leave the specifics of this rendering as an advanced exercise for the user. If we clear our cache and reload with the above in place, we’ll get the following error. Whoops! We forgot to create our Pulsestorm\SimpleValidUiComponent\Block\Example class. Lets do that now. These are standard block classes rendered via the current area’s layout, and need to extend the Magento\Framework\View\Element\AbstractBlock class. Normally these are phtml template blocks, but we’re using a block with a hard coded toHtml method for simplicity’s sake. If we reload with the above in place, we should see our block rendered. 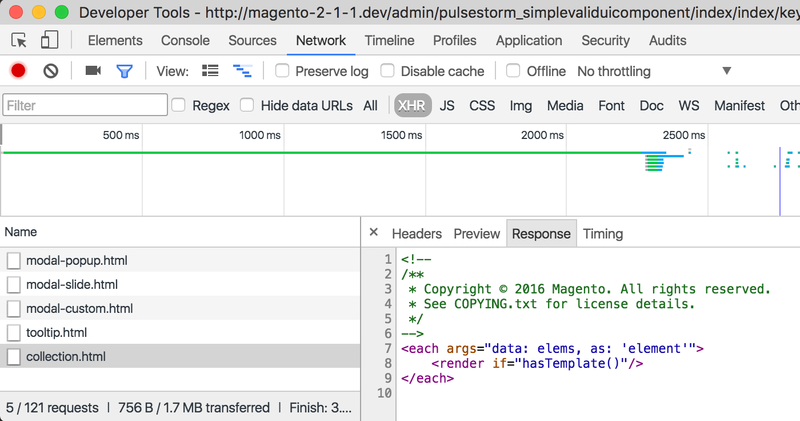 We’ve also removed the block argument, as this was required by the Magento\Ui\Component\HtmlContent class our Pulsestorm\SimpleValidUiComponent\Component\Simple replaces. We’ll also (of course) want to create our Pulsestorm\SimpleValidUiComponent\Component\Simple class (confused by this? Checkout our previous article for the server side functionality of UI Components). and then, (conveniently covering our third Have that RequireJS view model constructor factory point to a new Knockout.js template point), have that RequireJS module return a view model constructor with a new Knockout.js remote template. and then create the Pulsestorm_SimpleValidUiComponent/pulsestorm_simple_template template. Congratulations! You’ve just successfully created a UI Component, fully under our programmatic control, without violating Magento’s XSD schema validations. Whether or not this is a good idea or not remains to be seen. While we’ve taken every step possible to keep our htmlContent node under our control (custom PHP component class, custom RequireJS component, custom Knockout.js template), it’s still theoretically possible that a future change by the core Magento engineering team might break what we’ve done here. Right now, a fundamental problem with UI Components is all the programmatic and political evidence points to them being for the core team only, and only time will tell if third party developers are meant to, or will be able to, incorporate them stably into their extensions.